One great way to take full advantage of your outdoor space is by adding a light, airy and inviting pergola to your design. Regardless of the size of your landscape, if it’s not functional it’s not usable. Some homeowners have large open yards with lots of sun and room to run around but this type of dreamspace can quickly turn into a nightmare on a hot summer day when there isn’t any shade. Other homeowners may have enough trees in their yard for shade but not enough for privacy or a delineation of spaces for entertaining. The key to making a landscape purposeful is by maximizing its ability to be enjoyed. And pergolas are perfect for that. 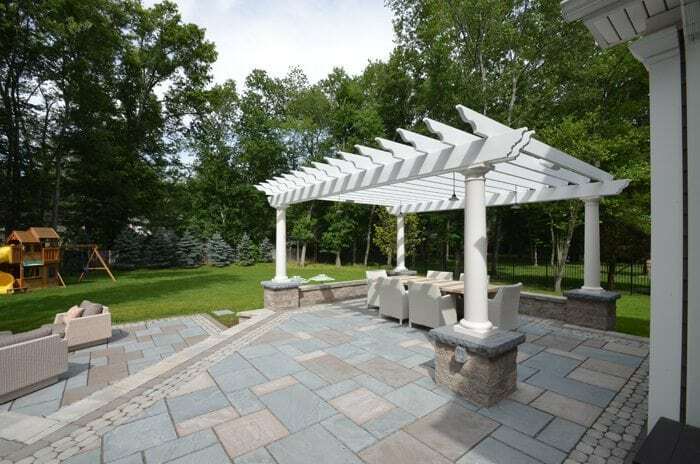 Defining a large open outdoor space with a pergola makes the area more functional and enjoyable because it creates a place to relax out of the elements. Constructing a pergola near an outdoor kitchen or barbecue is a great way to get the entire family outside to share a meal. 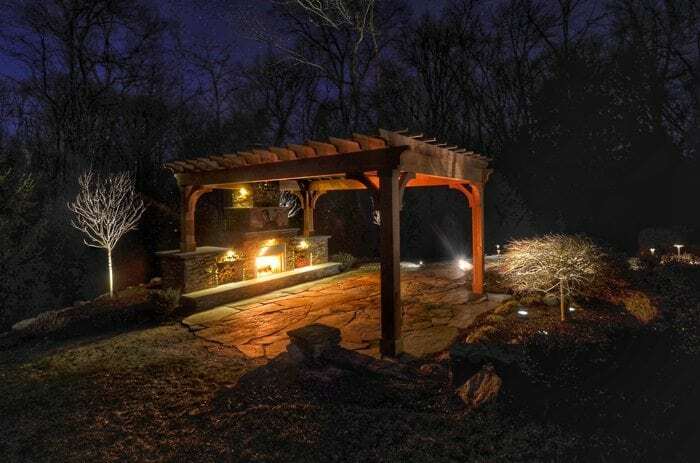 By customizing your pergola with lighting you can create the ambiance and appeal you want for your guests. Another great spot for a pergola is near your pool. 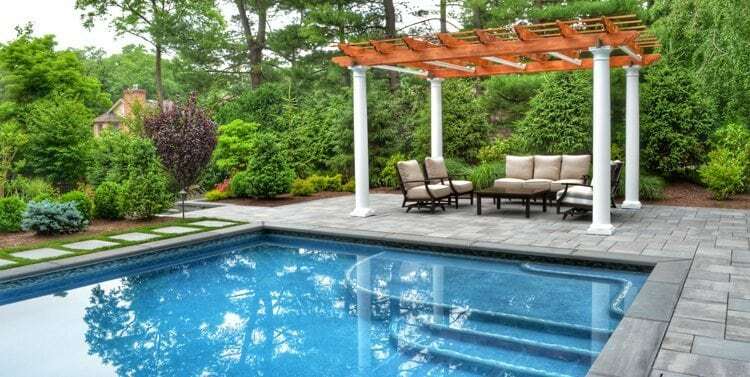 Building a pergola near a pool or spa leaves you with the option to take a break from the sun with a cold drink and an oversized lounge chair. In a smaller yard, a pergola can also benefit the space by adding a focal point and drawing the eye into the best aspects the landscape has to offer. Designing a pergola in your garden can give it the feeling of an entryway into a quiet and shady spot to relax and enjoy your own little ecosystem. 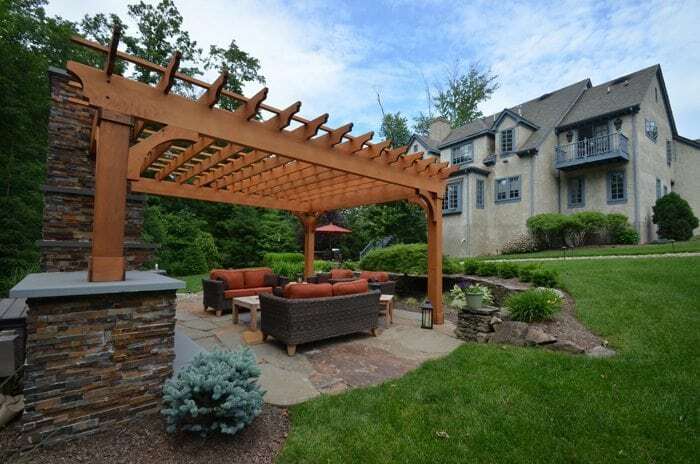 Whether you are looking for shade or privacy, a pergola is an excellent way to accomplish your goals. 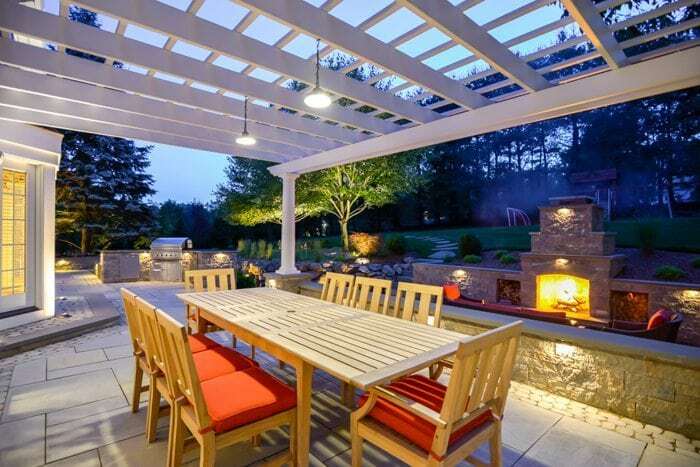 For privacy purposes, many people utilize lattice around the bottom pillars of their pergola. This design element creates the seclusion of a nook that is away from the view of others while still encompassing an open and airy feel. Work with your landscape designer to decide how much privacy, shade or sun you want your pergola to provide. The size of the pergola’s beams and their spacing will allow for more or less light and privacy. If you are trying to stay cool and maybe catch some zzz’s in the shade, then incorporating UV resistant fabrics to cover the top beams will keep you cool. As a bonus you’ll protect your outdoor furniture from fading. Retractable pergola shades are another option for homeowners who want to get out of the sun during the day but still want to enjoy the stars at night. With more and more homeowners designing vertical gardens in their yards, pergolas have begun to become an integral part of the process. Plants such as Ivy can be used to grow up lattice or beams of a pergola to create even more privacy and shade. Fruits and vegetables that need stakes to grow typically thrive near pergolas where they can latch on with ease. Don’t forget – plant some Lavender, Mint or even Catnip around your pergola to keep the mosquitoes and other pests away from your relaxing garden oasis. Realtors across the country have noted that quality landscaping increases a home’s value by 20%! Maximizing your yard’s potential and creating areas in it that are useful for the entire family is an essential way to “come out of the red” with your property. People looking to buy will always find homes with custom details more appealing and inviting. Creating shade and privacy with a pergola is beneficial for all of your outdoor entertaining needs and spaces, small or large. Most importantly, it is a wonderful investment in your home and future.